This week (March 5-9), candidates file paperwork to run for state office in Georgia. 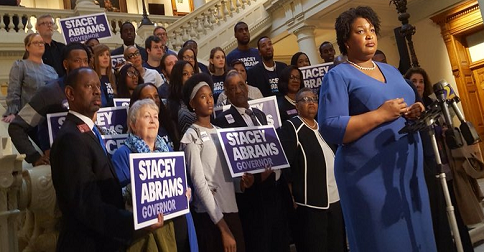 Yesterday, the most radical, left-wing gun-grabber in Georgia history, Stacey Abrams, filed to run for Governor in Georgia. She IS the likely Democrat nominee for Governor in our state. While serving as a member of the General Assembly, Abrams dutifully signed on to anti-gun witch Mary Margaret Oliver’s “assault weapons” ban and many other gun controls year after year. Make no mistake about it, Abrams’ “end-game” for Second Amendment rights in Georgia is ELIMINATION and CONFISCATION of firearms . . . The gun control bills (which we’ll be detailing in the coming months) she cosponsored would have done just that. As a reward for years of anti-Second Amendment advocacy, the Bloomberg / Soros-funded gun control group, “Giffords”, gave Abrams their first ever endorsement. Let me be clear — if Second Amendment supporters go to sleep, she very well could be your next Governor. The gun-grabbers are mobilized, organized, well-funded, and ready to do whatever it takes to win in a state like Georgia. That’s why it’s so important Republicans nominate a candidate for Governor who is 100% unequivocally “pro-gun“. In the coming weeks, Georgia Gun Owners will launch our 2018 GGO Candidate Survey Program. Every candidate for state office in Georgia — including ALL candidates for Governor — will receive a GGO Survey, asking them specific Second Amendment questions. Once the deadline to return the survey has passed, we will report the results of the survey to help inform you about each candidate for state office in Georgia. Stacey Abrams and the gun-grabbers will spend tens of millions of dollars to take over Georgia and destroy gun rights in this state. Now more than ever, you and I must remain active, mobilized and involved like never before. To help Georgia Gun Owners keep up the heat on our elected officials, please consider chipping in $10, $20 or whatever you can afford.